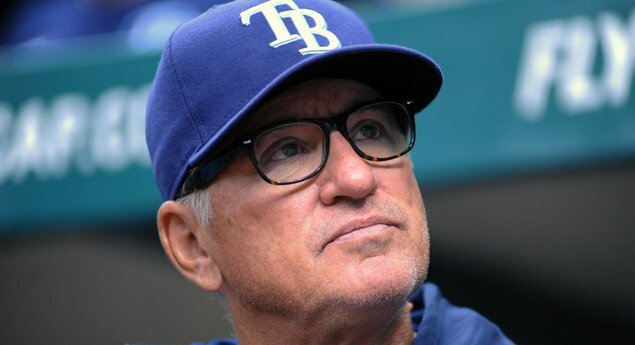 Joe Maddon: Genius or just crazy? Rays manager Joe Maddon: batting order mad scientist or just plain mad? If putting Carlos Pena in the lead-off spot the last two games is any indication, he may seem like a genius. LIVINGSTONE: Prior to the start of the day’s games, I always like to look at the starting line-ups. In the first quarter of the season, I’ve become fairly knowledgeable at what to expect from the way a manager arranges his batters to maximize run potential. Lefty out of the line-up due to unfavourable pitching match-up; moving a middle-of-the-line-up guy up a few spots because of a good match-up with the scheduled starter, etc, etc. In fact, many managers follow a quasi-standard approach to the line-up. Speed at the top, above average power and on-base percentage in the two-hole, power through the middle – with a smattering of speed in there as well – and then so on down the line with a mish-mash of speed, power, contact hitters in the bottom third. Then there is Joe Maddon. Looking at the line-up for the Jays-Rays game Tuesday night in Tampa Bay, I wasn’t completely shocked to see the regular clean-up hitter, Carlos Pena, hitting lead-off. Yep, lead-off. Upon first seeing this, I thought maybe it was an error on Maddon’s part, but then remembered that the long-time Rays bench coach likes to think outside the box when it comes to forming his starting line-ups. The strategy is simple, I think: put together the best possible line-up that will bring the most effectiveness to the offense. Sure, Pena at the top doesn’t bring much speed, but as we saw in the 8-5 victory over the Jays, having Pena at the top paid off in the way of a three-run home run and what would be the turning point for the Rays in taking the game. Yeah, if they’d lost it might have raised questions about the move to put Pena there, say if they needed a speedy contact hitter at a given moment in the game – but that wasn’t the case and Maddon, in his thinking, looked like a genius.